Inorganically produced cores are now widely used in German automotive aluminium foundries. Foundries all over the world are closely following developments in the field of inorganic binder technology and the environmental and production related advantages they deliver. Against the background of variations in technology, production standards and climatic conditions, the question arises as to whether and to what extent this technology can also gain acceptance in other countries and continents. Current research and further developments are set to create the prerequisite for this. Many developments in the foundry industry have their origin in Germany – driven pri marily by the high demands of the country’s automotive industry and ever stricter environmental legislation. Suppliers of foundry chemical products make a crucial contribution to technological progress within the industry. These developments help, for example, to make cars lighter and more economical, and to save resources. Feed materials themselves are also optimised with a view to their environmental compatibility. 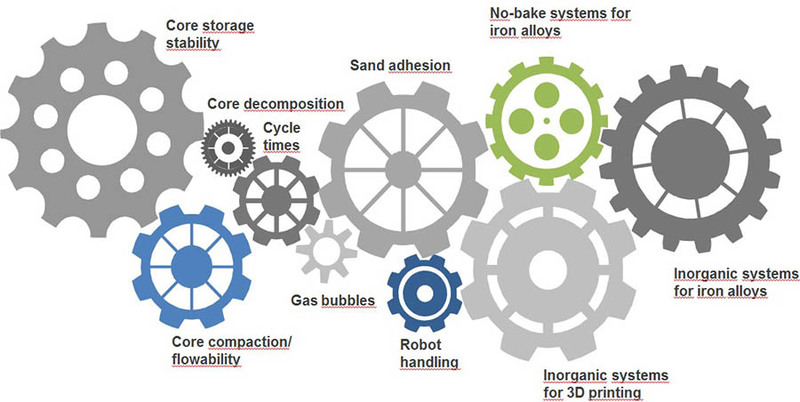 Thanks to inorganic binders (IOB), the vision of emissionfree casting has al-ready become reality in Germany. Meanwhile, the demand for this technology is also growing in other parts of the world. The chemistry of carbon-free compounds is commonly referred to as “inorganic”. In foundry chemistry, the term refers to a particular class of core binders which, owing to their composition, are completely different from the conventional binders based on organic chemistry. Carbon-free, i.e. inorganic, formulation enables practically emission-free casting. In terms of total volumes, inorganic binders currently represent a relatively small propor-tion of the binders used around the world. But their use in foundries has spectacularly increased in recent years. Various German automotive manufacturers, as well as some large foundry companies, have successfully established inorganic chemistry in their serial production. 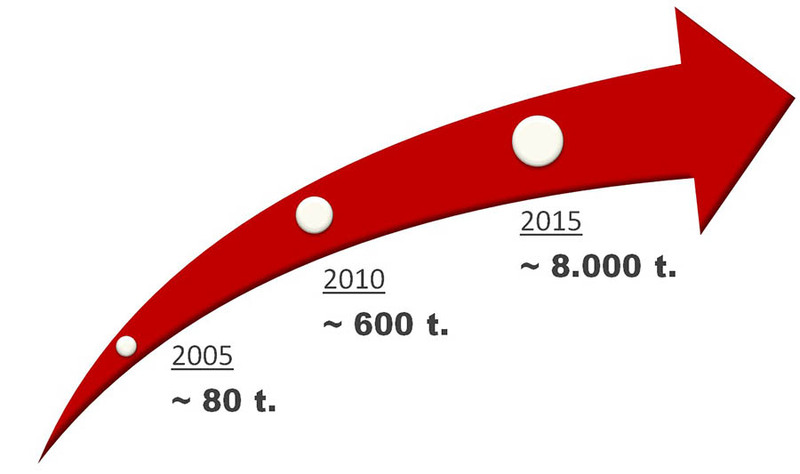 Fig.1 The sales volume of inorganic binder systems has grown strongly over the last 10 years. Thanks to continuous innovation, doubts about the efficiency and cost effectiveness of inorganic binder systems could be dispelled in recent years. Success stories are setting precedents and are being shared among foundries around the world. Many well-known, globally positioned foundries are now turning to “inorganic binders” and investigating the feasibility of changing their technology. In other major industrial countries, too, rising energy costs and a growing awareness of environmental issues have triggered a rethink in the foundry industry. Stricter emission standards are also becoming a driver for product and process innovations in Asia, for example. In pursuit of sustainable production processes and better working conditions, there has been increased interest in core production processes other than the organic processes, which have so far dominated. The principle of core production using Hüttenes-Albertus’ inorganic binder system is based on water glass; however, it is far superior to the water glass binders of the past. The inorganic Cordis binder is a modified silicate solution mixed with core sand and the additive Anorgit. In heated core boxes, this mixture is cured to form a three-dimensional cross-linked matrix, which gives the sand core its strength. In addition, the cores are gassed with air, heated to 130°C. The water in the cores changes into the gas phase and is expelled. The curing process involves only heat and the elimination of the water solvent. As no combustion products are generated during curing, there are no emissions, i.e. no fumes, no BTX or BTEX, no amines, no odours. Carbon dioxide emissions are also greatly reduced. Moreover, there are no condensate deposits on the mould, which ex-tends the useful life of the tool. Due to the endothermic behaviour of inorganically bound cores, the material properties can also be precisely controlled in the aluminium casting. HA’s inorganic core process allows the production of high-quality cast parts and the ability to create complex core geometries – as well as outstanding cast quality. Inorganic cores – also uncoated – are used for cast surfaces, which are on par with those pro-duced by organic processes, and sometimes even better. In addition to environmental and production-related benefits, the system also makes economic sense. On the one hand, a shift to inorganic core production requires investment in new production technology. On the other hand, it also enables cost savings: emissions are avoided which eliminates the need for investment in extraction and air purification equipment. 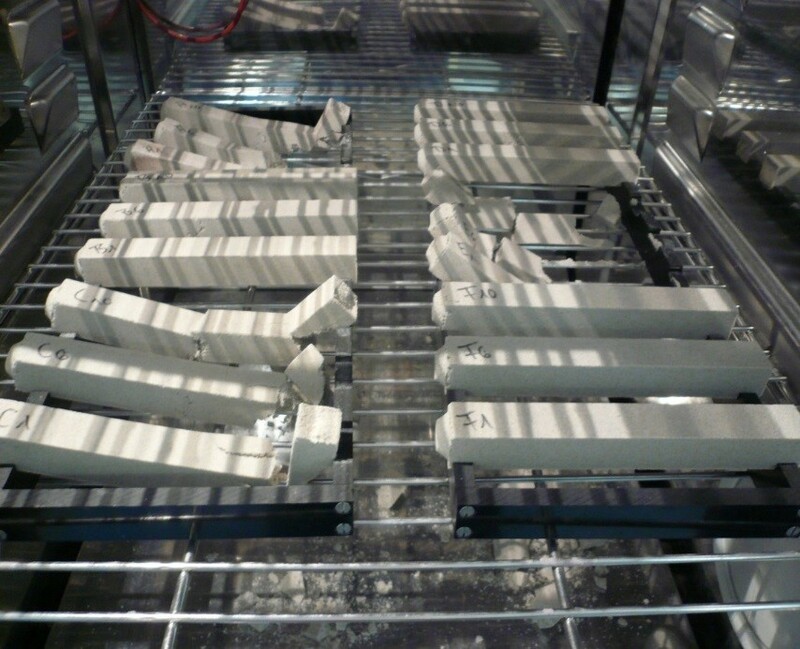 Since the organic process does not cause condensation, cleaning costs of the cast tools and the consumption of foundry auxiliaries are reduced. The extended service life of the tools brings additional cost advantages. Working conditions during inorganic core production are also significantly improved because there is no odour nuisance during the core production and casting processes. As there is no need for extraction at the core machine and the casting table, the noise load is equally reduced. As experience shows, foundry employees who have worked in inor-ganic core manufacturing do not want to return to an area where organic binders are used. Even though inorganic binders have now matured to the stage where they are able to deliver stable, high-quality results, their development is by no means at an end. Foundry specialists and chemists at Hüttenes-Albertus have been working intensively over the last few years to further improve the products. In order to enable their use in Asian countries, a particular challenge must be tackled: storage stability under humid and warm conditions. By their very nature, cores based on water glass tend to take up moisture from the air, which is due to the hydrophilic proper-ties of inorganically bound cores. They seek equilibrium with the relative ambient humidity and/or ambient temperature. This means, that in the case of high humidity and high temperatures, curing is partially reversible; the cores may lose their strength and be easily destroyed. One way to pre-vent this is to use air-conditioned storage rooms which are adjusted to a humidity of 30-50%. However, these types of storage spaces are not always possible. Inorganic cores guaranteeing storage stability even in difficult climatic conditions are therefore prerequisite for inorganic technology to be a viable alternative in countries such as China, Japan or Mexico. With this aim in mind, HA has spent the last few years working intensively on the further development of the Cordis binder and Anorgit additives. To this end, HA’s scientists are developing sound ideas and solutions, which are then extensively tested under laboratory conditions. Possible new product formulations are tested on trial cores stored in the climatic chamber at a variety of defined temperatures and atmospheric conditions. The results provide important parameters for the foundry supplier and its customers. When a possible solution has been found, internal casting experiments are carried out to check whether a new modification is fit for practical use. Only then a small batch test is performed, followed by a large batch test and, eventually, introduction to a customer’s serial production. In this way, new product generations are created in the field of inorganic chemistry, which further optimise the performance properties of emission-free binder systems step by step. It has thus been possible to achieve a significantly better cross-linking between additive and binder compared to earlier product generations. Special additives in the binder specifically influence the hydrophilic character of the cores, increasing their resistance to elevated air humidity. Cores made with the latest generation of the inorganic binder system can be stored for four to five days at 30°C and 70% relative humidity without any significant impairment of strength. In addition to the selection of binders and additives, there are further parameters in foundry operation which can be used to influence the storage stability of the cores. An important factor is, for example, the thickness of the core shell: the thicker the shell, the more stable the core is in storage. The formation of the shell, which plays an important role in determining its final strength, can be specifically controlled via the temperature and the dwell time in the core box. The choice of the sand also has an impact on the storage stability. Sand with a smaller grain size has a higher capillary action and there-fore draws water more easily into the core. The fundamental feasibility of the inorganic chemistry has now also been proven in Asia. It is already being successfully used at major international foundries in China and Japan. Looking at the progress that has been made in the field of inorganic binder systems over the past decade and projecting them into the future, the field looks promising. Development is also progressing to the extent that interest in this technology is growing in other countries. There continues to be a high level of innovation potential. In addition to storage stability, various other properties are being further optimised and additional fields of application are being developed. Through constant research and development, the boundaries still in force today are progressively being shifted.